the Biologic iPhone bike mount is what we have found to be the best way of mounting your iPhone 3 or 4 onto your bike. we only have 1 as our parent company Momentum Automation bought a few to try out new bike related IT ideas, they ordered more than needed in case they broke one, they didnt so this is for sale. Compatible with iPhone 4, iPhone 3GS, iPhone 3G, and iPhoneThe BioLogic Bike Mount for iPhone 4 lets you attach your iPhone 4 to the handlebar of your bike so you can use GPS and an appropriate app to track your position, your speed, or distance travelled, while you ride. 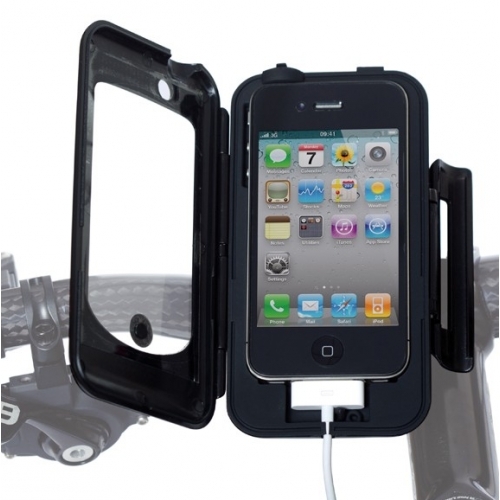 The Bike Mount is a weatherproof case with a welded touch sensitive membrane so your iPhone is completely protected from the weather but still fully functional. The inside of the case is lined with silicone for shock resistance. The Bike Mount pivots so you can use your iPhone in portrait or landscape mode. Membrane protected openings for the front and rear camera lenses lets you take video or pictures while you ride. Fully compatible with the BioLogic ReeCharge. Suitable for handlebars or stems with a diameter of 38 mm (1.5”) or smaller.